I have a confession: Journalists are messy – Pamela Wood. That’s right. We are messy. In the real world, I have an average dedication to cleanliness and organization. In the journalism world, I’m considered a neat freak. 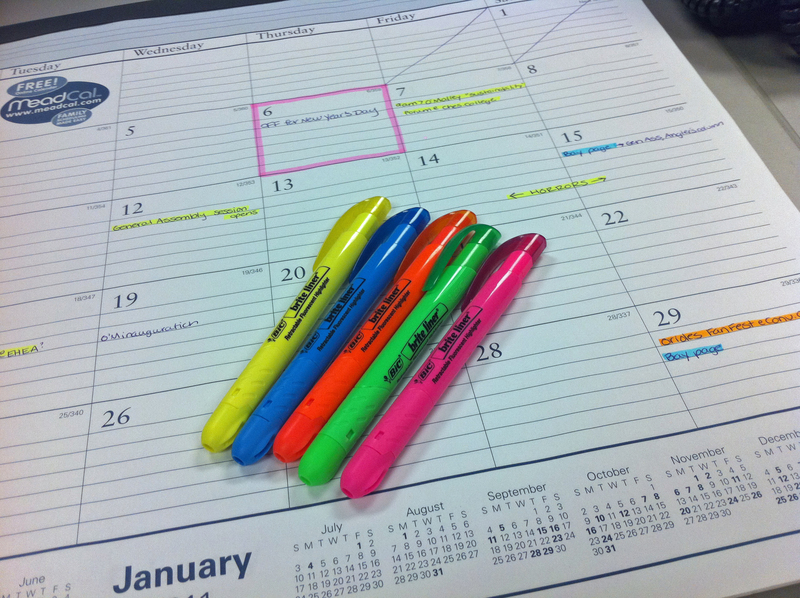 I'm such a dork, I use color-coded highlighters on my desk calendar. Seriously. From the top side, my desk looks unnaturally clean and organized. But I have a secret literally lurking down below. I have so many boxes and bags that I barely have room to stow my purse and camera bag under my desk. I’m constantly hitting things under my desk with my feet. I have a secret: I hate throwing away newspaper clippings and notebooks. Have I ever needed to pull an old news article from these envelopes? Ummm, no. Never. Will I ever have to? Probably not. What’s funny is that the vast majority of these stories are pretty routine: Crab population up, crab population down. Chesapeake Bay dead zone bigger than average, dead zone smaller than average. Sure, there are some good stories in there, but I already have many of my best ones featured here on my website and saved in more accessible places. And even if I need any old stories, they are cataloged electronically at my newspaper. And if I leave my newspaper, I can get the stories through the Lexis-Nexis database. There’s something about cataloging everything that I can’t let go of. I like knowing I have a tangible record of my work. Uh-oh, now I’m starting to sound like someone on one of those hoarding TV shows! At least I can take comfort in the fact that my collection of clips and notebooks is somewhat organized. And they’re not impeding my life too much. (Kicking things over aside.) And heck, if I had more initiative, I’d be happy if they were all up in my attic. I just don’t feel like lugging them to my car, hiking them up the stairs, scaling the ladder and getting them up in there. And I can also take comfort that I’m not alone in hoarding notes and stories. The newsroom recently had a bit of a mid-winter cleanup. We cleared out notes and papers from unused desks as well as our own desks. 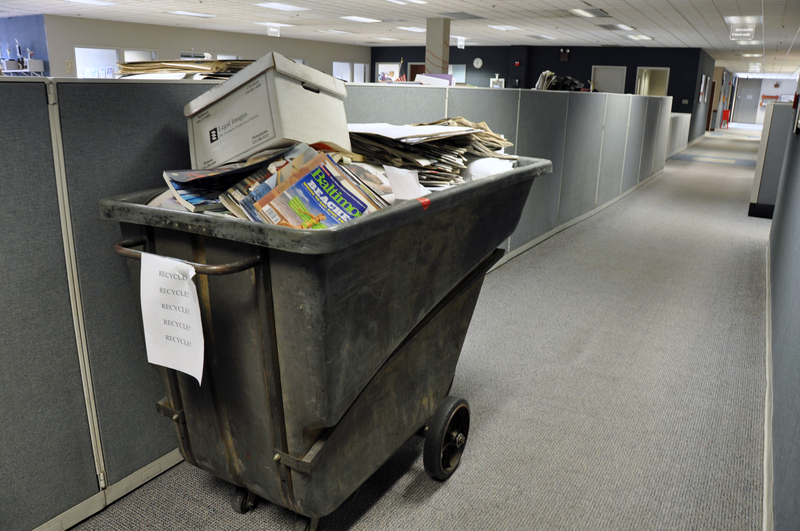 It did not take long to fill up a huge recycling container — and we didn’t even make much of a dent in the newsroom clutter. 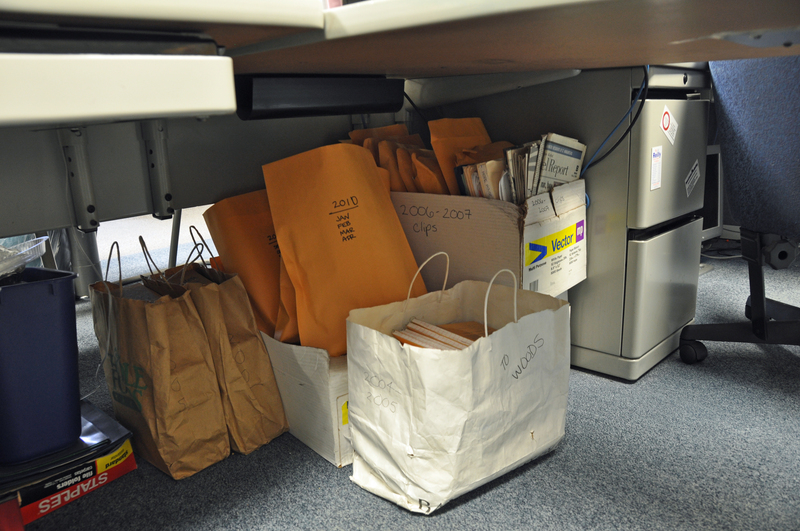 During a newsroom spruce-up, it did not take long for a bunch of pack-rat reporters to fill a giant recycling bin. Next postHey, that’s my story! Pam, you do have a problem. At least throw the notebooks out! there is no way you’d need something from one of those that’s not duplicated somewhere else. but letting it go is so freeing! when i moved desks i did a major purge, it was awesome!! keep the clips, ditch the notebooks. 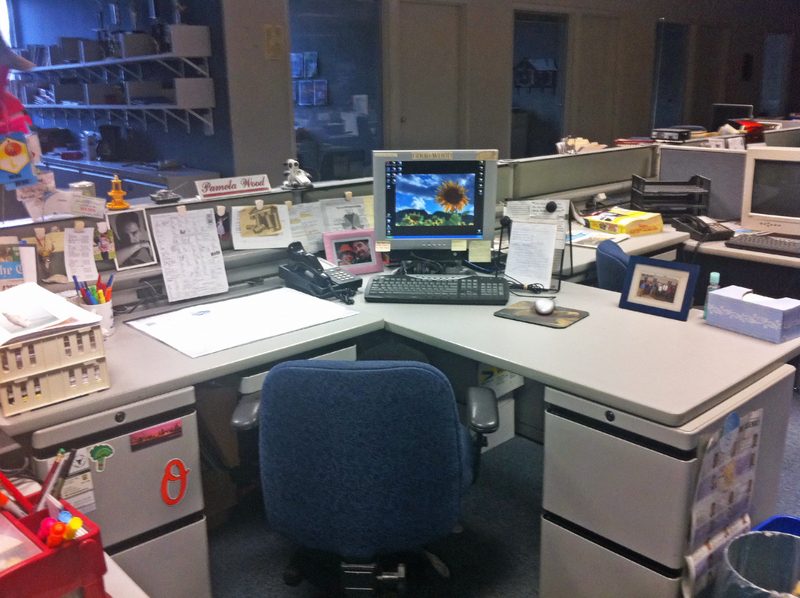 I found this post when I googled “Newsroom desk” in an attempt to help my coworkers understand that, by journalists’ standards, my desk is actually quite tidy. I have a whole drawer of reporter’s notebooks in my office. I never look back at them. Ironically, the only one I can’t find is the one that has some photo captions for a story I’m working on. Surely it’ll turn up in the next week or so, right? It has to be here somewhere.